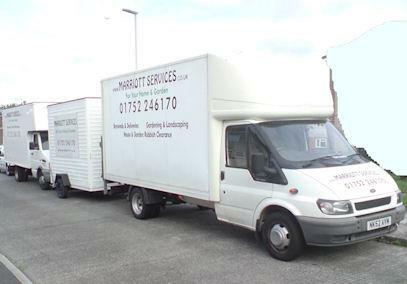 Marriott Services is a family run business based in Southway, Plymouth. They can build you a garden Fence or extend the useable area with a Deck. They can help to get your garden back under control if it's overgrown. They are licensed with the Environment Agency to carry waste, so you don't have to search for a different company to do that after the work is complete. With specialist equipment and friendly staff, the company is able to offer a professional service to customers at a very competitive cost. The company delivers a wide range of services that are tailored to requirements and fit the needs of customers. Marriott Services has an expanding network of clients, situated in and around Plymouth. A lot of their customers are repeat customers, having used Marriott Services to move homes, they have then called upon Marriott Services to work on the new house and gardens. We are 2 brothers and have worked together for many years. We are hoping to expand and take on more staff over the next few years. We are fully licenced to carry waste and are registered with the Environment Agency. We have full insurance and breakdown cover. We are members of the FSB. - Pressure Washing and Gutter cleaning. Please see web site for full details of work offered. Our fees start from just £15 per hour. We do NOT add anything on to our costs for materials, so the price we pay, is the price you pay.